An animated skeleton wreathed in hellfire and pungent black smoke, this horrific monster seeks to feed all living things to the eternal flames which consume it. Heated Body. A creature that touches the skeleton or hits it with a melee attack while within 5′ of it takes 3 (1d6) fire damage. Death Blast. When a flaming skeleton is reduced to 0 hp, it explodes in a fiery blast, doing 3 (1d6) fire damage to every creature within 5′ of it. Multiattack. 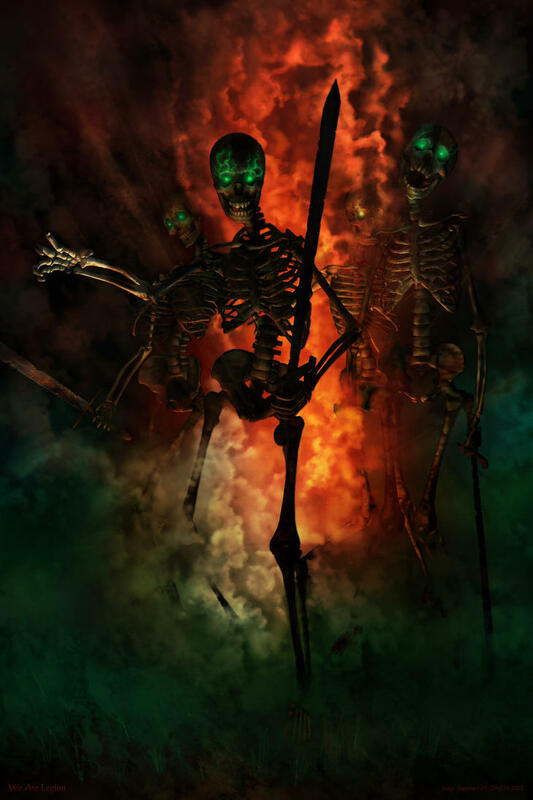 The skeleton makes two attacks with its flaming scimitar or its flame orb, or one attack with each. Flaming Scimitar. Melee Weapon Attack: +3 to hit, reach 5′, one target. Hit: 3 (1d4+1) slashing damage plus 3 (1d6) fire damage. Flame Orb. Ranged Weapon Attack: +4 to hit, range 30’/100′, one target. Hit: 7 (2d6) fire damage. It’s no secret that I love, love, love Dungeons & Dragons fifth edition, but like everything it’s not without its flaws– mostly in the encounter and monster variety area, which in my opinion has needlessly abandoned some of the few really good ideas from 4E. Fortunately, these are easily fixable without messing around with the rules, it’s just a matter of building the content to fill the gaps. One notable thing that’s missing in a big way is ranged threats to mix in to encounters. Most monsters are melee, melee, melee, with maybe a crossbow added at the bottom as an afterthought, and low-level corporeal undead are particularly egregious in this regard. So here’s something to correct that: meant to be primarily a support monster for a larger group, the burning skeleton hangs back and lobs fire orbs into the fray, only engaging in melee when forced to, and then likely to go out with a bang. Mechanically, it’s mostly a reskinned fire snake with skeleton traits added. I have more to say on the subject of encounter and monster design in 5E, which is for another post. Come Find Me at AnthroCon!